The start-up costs to start most “brick and mortar” businesses are at times astronomical at worst and very difficult at best. Fortunately for freight brokers, it is much less costly to get started. It can be a work-from-home business, no rent, no employees, no inventory. Assuming a person has a good computer, telephones, and a fax, the start-up costs can be less than $1,500. That is not bad and, and with training included, it is less than $3,500 to get started. You will also need a UCR registration. It is $76 if purchased directly from the government. These costs would include payments such as your load board fees, your telephone expense, and your office supplies. Starting out, these three expenses will most likely be your biggest operating expenses. Operating expenses also include salaries, rent (if applicable) and anything else needed to maintain your business. You might only be looking at about $250 – $500 per month. These expenditures would include items that are normally depreciated because they have a useful life greater than one year. Equipment, vehicles and furniture would fall into this category. Most individuals already have some type of office in their home – computer, fax, telephone. Borrowing from banks, credit cards, family, friends or from yourself are other money sources. If you loan the company money from your personal assets, you may treat the loan either as a formal loan or as capital infusion (See 2 below). Any loan arrangement should be formalized with an agreement specifying the cost and repayment terms. Capital infusions might be money funds from your savings, retirement funds or investments. These would be YOUR monies that you are giving to your business. These would be equity infusions and your subsequent profits would give you your return on equity. Family and/or close friends can form a partnership with you and invest money into the business. Different profit/equity sharing arrangements should be formalized with a good partnership agreement. Partners may be silent or actively involved. A good partnership agreement would spell out the scope of authority, duties, responsibilities and expectations of each partner in addition to the profit/equity sharing arrangements. 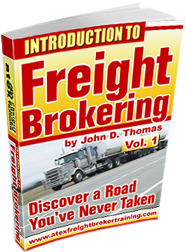 Since most freight brokerages are non-asset businesses, this type of money source is usually not available. But personal assets can be sold to provide money to either loan to the start-up company or to provide a capital infusion. Using factors may be a good source for paying trucks once the business is underway. Factor companies will advance monies to the freight broker based upon the brokerâ€™s accounts receivable. The freight broker normally does not undergo any type of credit check because the factor will be looking to the creditability of the shipper. This type of financing will normally be more expensive than bank financing but it depends on the circumstances. The most important item is the fact that this type of financing is very convenient. Sales and revenues will hopefully be the primary source of cash AFTER you have gotten established. Grants are monies given outright to business owners due to the fact that the business owner falls into a certain category. For example, some states or regions hard hit with a poor economy may offer grants to new business owners. This money is usually not expected to be paid back. If you have disability insurance and if you are deemed to be eligible to receive payments, your start-up and some of the operating costs could be covered. Angels may be individuals or organizations who give money to worthwhile causes or individuals. Angel financing is a long-shot but this type of financing is very real to those who are the recipients. This is a traditional bank loan with a fixed or possibly variable interest rate for a certain number of months or years. For some people, getting bank financing is difficult. Nowadays, many banks are requiring that a business be in business for at least three years before asking for a loan. The thing to remember is that each lender has its own policy. Check out ‘Micro-Loan’ lending sources for Small Business Administration (SBA) guaranteed loans. They provide loans between $5,000 to $25,000, low interest rates and no collateral. To Explore Your SBA Financing Options, Go Here Now: SBA Micro Loans. This particular provider is ‘the Nation’s #1 SBA lender by volume’. Do not give up too soon when seeking financing. Even if you are turned down by one lending source, it does not mean you will be turned down by every other one. A good business plan, cash flow projections plus providing other useful information will help you go a long way in working with lenders. Line of credit – this type of financing may be through a traditional bank and may be contingent upon your accounts receivable using these as collateral. With a line of credit, you can draw down and pay bills and you can pay back anytime your cash flow permits it. This reduces your carrying costs and interest expense. Credit cards – how many times have you received offers or promotional checks with low introductory rates? These may actually become a good source of financing. Transaction fees usually run 3% with a minimum of $35 and a maximum of $75. Weigh the cost with the benefit here. Did you know that you can often make a phone call to request a higher line of credit or to reduce your current interest rate? If you are a good customer, they may make it very easy for you to get a higher line of credit.